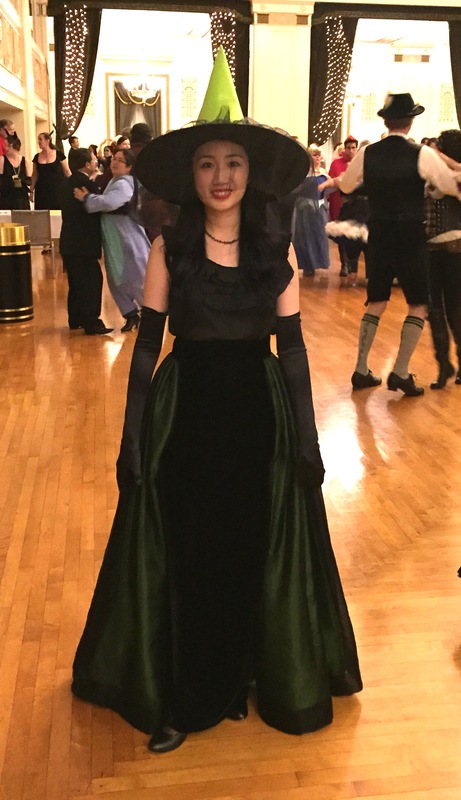 For the red carpet and gala dinner at Costume College last week I wore my finished Lady Tremaine costume! I mostly do historical costume, but I enjoyed doing cosplay as Cinderella’s stepmother. I started this project last year, and it was So Much Work making all the layers and pieces, and cutting out and applying all the floral appliques on the bodice, skirt, and hat, but it was worth it in the end! (You can make your own too! At the end of this post I list all the materials and tutorials for the skirts). My wig was a little small for my large head, but my friend Natalie still did an amazing job styling my wig! She used a large hair rat to make a big roll in the back, then did a few pincurls. Here’s a few shots from the hotel room. The earrings and brooch are vintage, while my gloves and bracelet are new. When lining up for the red carpet I ran into another Lady Tremaine! I didn’t have time to put in boning, and I have terrible posture, so whenever I slouched you could see the bodice wrinkling. My improvements wish list for next time are boning, maybe some black crystals around the flowers (just like the movie version), and possibly a a larger wig. At the end of the evening I found a shoeshine stand in the hotel to sit on. I felt like a shoe advertisement. 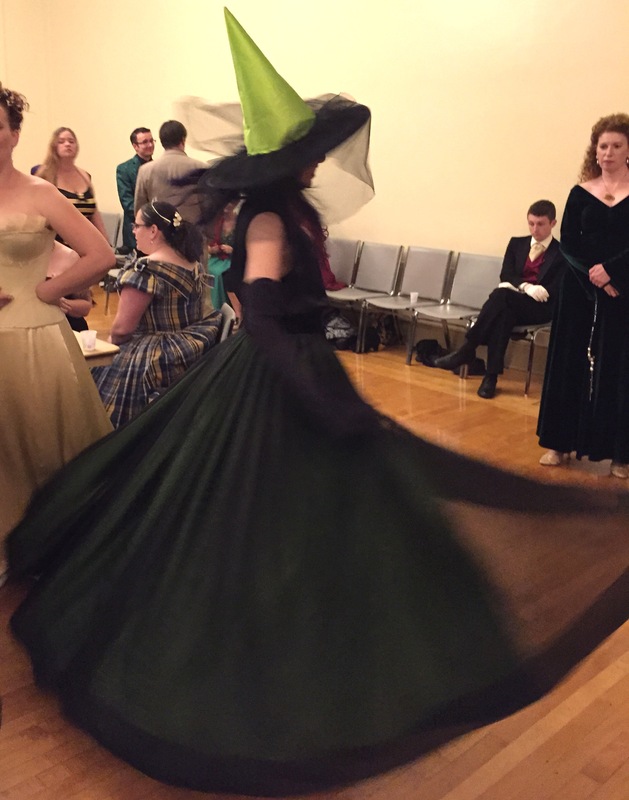 “Lady Tremaine prefers American Duchess.” (I am wearing the black tango boots). I am looking forward to wearing this again! Ok, the final tally! I normally spend about $100 per costume, but this was a very special project, with its own special budget, and not something I would make every year. Some techniques were new to me, and there was also some trial and error, with some materials purchased but ultimately not used. So here is the list (including some Amazon affiliate links)! *Fabric Wholesale Direct very kindly gave me all the satin, organza, and velvet for free in exchange for two tutorials I wrote for the velvet skirt and the overskirt so if I subtract out what they gave me . . .
And 40 yards of materials! If you’ve made it this far, thank you for reading this monster post! Stay tuned for posts from 4 days of Costume College! 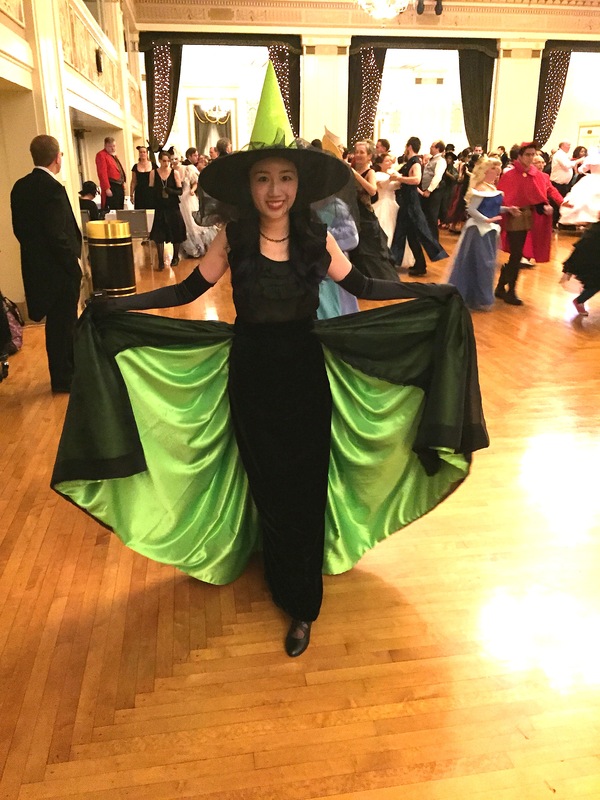 Posted in Lady Tremaine, Uncategorized and tagged big hat, costume, Costume College 2016, Disney, Lady Tremaine, sequins, sewing. Bookmark the permalink. 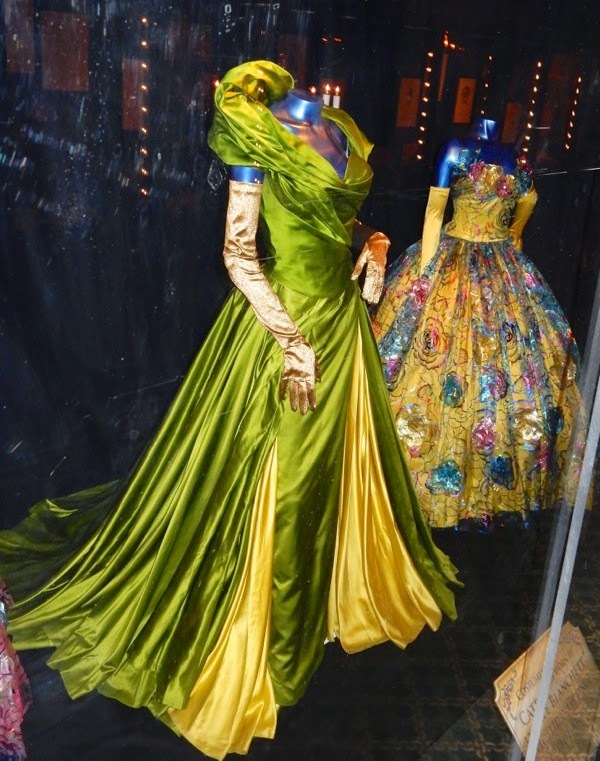 I haven’t been able to personally visit the current FIDM exhibit of the Oscar-nominated films, which includes costumes from Cinderella! I hoped someone would post detailed pictures of Lady Tremaine’s traveling outfit, because I have been wanting a close-up of the seams to help me with my own project. Lucky me, wishes do come true. Many wonderful pictures have been posted at the Hollywood Movie Costume Blog, and you should definitely check them out! Jason, the owner of the blog, has graciously allowed me to repost some of the pictures here. All pictures below are from and belong to the Hollywood Movie Costume Blog; please do not repost without permission from Jason Morgan. Here is a front view of the bodice. I have been looking but haven’t been able to find any front bodice seams in any of my previous research. I still do not see it here, and based on the puckering I am starting to suspect there are none. One interesting detail I had not noticed before is the horizontal seam in the elbow of the sleeve. I presume it is to allow for some ease of movement since the sleeve is tightly fitted, however that means if you look carefully the pattern does not match. Here is a great shot of Lady Tremaine’s hat and veil; you can see it is translucent. There appears to be some padding in the shoulders of the bodice to make it stand out a bit. The elbow seam is more obvious here. This back view shows that the bodice opens in the back. There is one long seam down the center back, possibly closed with hooks and eyes or a hidden zipper? Please take a look at the Hollywood Movie Costume Blog for additional photos. I will also be updating my costume analysis page with these photos! Posted in Lady Tremaine and tagged costume, Disney, Lady Tremaine. Bookmark the permalink. At long last the skirt for my Lady Tremaine outfit is done! I’ll post a tutorial for the under and overskirts later, but for now here are some pictures of the two together. First is a side view. I stuffed a pillow under the skirt for the photos, but later I will be making a small bustle pad specific for this outfit. Here is a view showing the open front with the black velvet underskirt. I took some liberties with the flowers. I used a lot of poppies and leafy sprigs, while Lady Tremaine’s skirt has more abstract flowers and vines. Since the skirt is open in the front, I put the closures on the side. 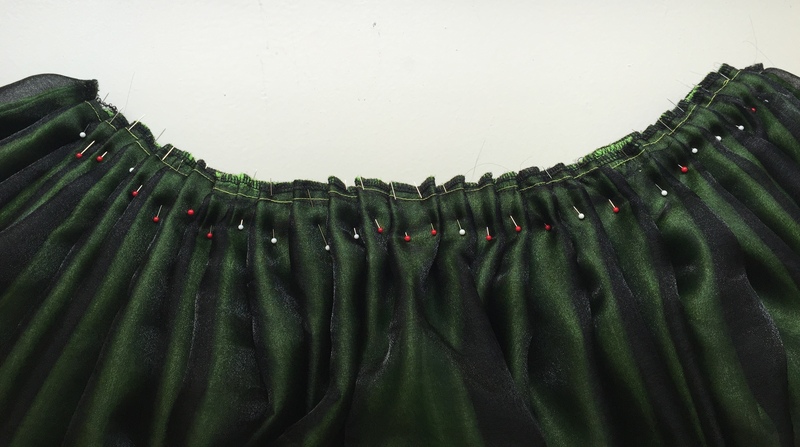 The skirt is pleated into a velvet waistband made from the same fabric as the underskirt, and closes above the hip with some heavy duty hooks and eyes. If you’ve been following the story, getting the material for the appliques was quite the saga! Supplier #1 sent me a bright neon green flocking material, when I wanted chartreuse. I couldn’t find chartreuse flocking anywhere, so I switched to wool-blend felt. Supplier #2 had to send me felt swatches twice, after the first set got lost in the mail. After I received the swatches, Supplier #2 said they didn’t have the full amount of chartreuse felt I wanted. I felt the felt (ha!) I did get in the end didn’t cut cleanly enough for the flowers to have neat edges, so I went back to flocking. I took a gamble on Supplier #3, where I bought a roll of flocking. Despite being labeled “green,” it was a little too yellow for me, but still better than the bright neon green I got at first. I would have preferred a color in between the two below, but the bottom is still closer to what I wanted. I used a Silhouette machine to cut the outlines of the appliques, then used a little hook and spatula to weed out the excess material (which took a really, really long time). What is left behind is velvety flocking on one side (and attached to a plastic backing sheet), while the other side has a heat-sensitive adhesive that melts into the fabric. This was probably the most terrifying project I’ve done! The iron had to be hot enough to fuse the flocking, but not so hot it would melt the organza. I had to make sure the adhesive didn’t bleed through the organza into something else underneath, so I had to protect the areas around and beneath the applique with plenty of parchment paper. Heat-transfer flocking is best done with a large heat press, but I used an iron. I had a little bit of puckering in some areas, but I think the iron gave me more control, especially over the small detailed areas, even though it took longer! For the bodice I will be using black heat transfer flocking, which is luckily much easier to find. However, I’ll have to experiment again with the temperature sweet spot that will fuse flocking to sequins without melting them. Read parts 1, 2, and 3 here.